"How dumb can someone be? You may have noticed that there is an A list aging, but not old film star. Actually not A list. He's definitely A+. Some might even throw on another plus. Anyway, you will notice there is a certain woman he dates for a month or two and then she disappears. She then returns in six or seven months for another month or two. This cycle has been played out for a long time. Turns out that she is dumb. (How dumb is she?) I'm glad you asked. She is so dumb that our A+ actor has got her pregnant at least three times. Each time he tells her that he has had a vasectomy and so she can't possibly get pregnant. She always believes him and is always getting pregnant. In fact when she gets pregnant is when she disappears. Seems that is the actor's goal each time." The culprits: Possibly George Clooney and Krista Allen. They have been on/off since '03. Split dates 12/19/03, back together, split 3/19/04, back together, split summer '05, back together september '05, split again. 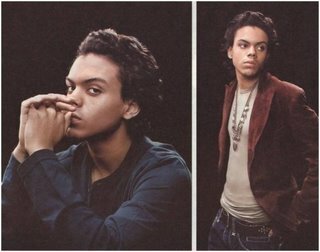 Is Evan Ross the Love Child of Michael Jackson? The Truth about Vanessa Minnillo and Lindsay Lohan? Former Hollywood publicist Jonathan Jaxon says Vanessa Minnillo, is definitely not who you may think she is. "I was shocked to hear from a very close friend of how close Lindsay Lohan and Minnillo were back in the day. The girls had more than a friendship going on. They actually shared a short love affair." Actress - "Honey you go on and I'll be there in a minute. I have some more press to do." The B-minus list actress then heads for a limo and climbs in. Stays in for ten minutes and gets out putting on fresh lipstick, and trying to fix her hair while she walks away. Out of the limo shortly after is an A list television actor (by definition) and sometime film actor checking to see if anyone noticed while tucking his shirt back in. Only about 30 people are standing around the limo. I'm sure no one will say anything. Ooops. Guess they did. Did I mention the A lister has a girlfriend? Britney Spears is going to ensure her mother never comes around her kids again. Spears just personally served her mother with a legal letter warning her to stay away from her kids. Click here to watch video of it all going down. Jonathan Jaxon's says: "After a recent re-uniting of Spears and her mother Lynne, Britney was miffed that her mother was going through her personal belongings to ensure she had no drugs present. Upon Lynne finding drugs, she threatened to take the kids away from Britney and take them back to Louisiana and give them a better life. Brits mother has wanted into her grandchildren's lives for some time, but Britney is afraid she will see more and build a case against Britney and take her kids." "I have been delaying this story for a later date, well here is that date...Ladies and gentleman, I present to you another druggie and gay in the closet, Aaron Carter. Back a few years ago, at a birthday party for music mogul Johnny Wright, Carter was seen making out and groping a fellow Hollywood type. Then later taking him to his hotel. Just last year, at Aaron's 19th birthday party in Orlando, he was caught in the bathroom snorting cocaine. Multiple amounts of it too. Aaron Carter, 19 years old, made his mark in the music industry as pop solo artist in the early 2000s. Carter, who has also launched an acting career, is also known for his relationships with actresses Hilary Duff and Lindsay Lohan." Matches this blind item at Crazy Days and Nights: This singer/reality star had a relationship with that waxy woman. Although he does enjoy the ladies, more than one relationship has ended because of his love of the men as well. Every time he is caught or confronted he always says it is the last time, but it seems he just cannot get enough. It has got to the point now that he is hollow inside and just goes through the motions with women until he can find one who is willing to let him explore or even join in. Anna Nicole Smith's ex-boyfriend Larry Birkhead has moved into the late starlet's California mansion with the couple's baby girl Dannielynn. Photographer Larry has told his friends that he enjoys spending time at the house as it reminds him of the times when he and Anna Nicole were together. Larry's sister says, "Moving into the house is emotional for him. Larry will sleep in the master bedroom, where he and Anna slept."